Sweep her off her feet with two dozen red roses in a grace clear glass vase. Whether for an anniversary, birthday, valentine's day or just because, this gorgeous romantic bouquet of 24 roses will win her heart all over again. 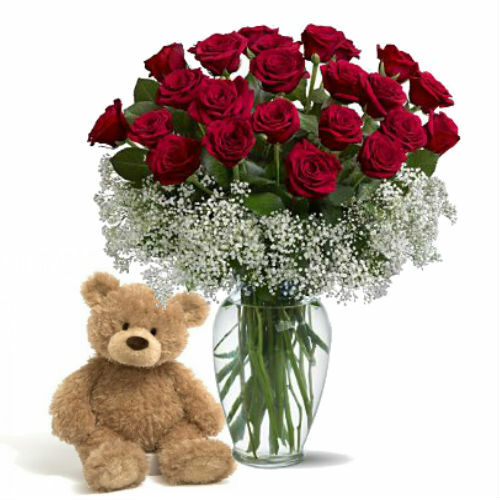 This romantic gift set includes a soft cuddly plush teddy bear paired with a bouquet of two dozen red roses accented with lush greenery. To ensure the best arrangement, flower accents may vary. Style and colour of plush teddy bear may vary depending on availability. Orders must be received before 2:00 p.m. (EST) in the recipient's time zone to assure same-day delivery Monday through Friday. For same day service on the weekend please order by 12:00 pm (EST) Saturday. If the exact flowers or container you have selected are not available, we will create a beautiful bouquet with the freshest flowers available. We will only substitute items of equal or higher value.